Yesterday we looked at Jesus of Nazareth’s life from when he was about twelve until the end of his twenty-first year. From what I was able to relate you will certainly have the feeling that some very important things for Jesus of Nazareth’s soul occurred during that period of time, most important also for the evolution of humanity. For you will certainly realize from the fundamental experience obtained from spiritual scientific studies that everything having to do with human evolution is interconnected, and that an event of such importance which happens in a human soul and is related to human history cannot be without importance for the whole of human evolution. We recognize just what the event of Golgotha means from the most varied viewpoints. In this lecture cycle we are attempting to obtain this knowledge through a consideration of the Christ Jesus’ life. Therefore we shall now again look at the same characteristic point in time we considered yesterday. What must have lived in Jesus of Nazareth’s soul after all the important events that happened to him up until he was twenty-eight, twenty-nine years old, and which I described yesterday? One can have a feeling for what lived in his soul from hearing about a scene that took place during his late twenties. The scene was of a conversation which Jesus had with his mother, with that person who had been his mother for many years through the consolidation of both families. An intimate and excellent understanding existed with her, a much better understanding than existed with the other family members who lived in the house; that is, he could get along well with them, but they didn’t really understand him. Previously he spoke with his mother about many of the impressions which had developed in his soul. But at the time in question a most meaningful talk took place between them, one which allows us to see deeply into his soul. He had become wiser over time as a result of the events already described, to the extent that an infinite wisdom was expressed in his face. But he also felt sadness, which is often the case, though to a lesser degree. Wisdom had the effect of causing him to be quite sad when he observed his human surroundings. Adding to this was the fact that whenever he had a minute to himself he thought back to how in his twelfth year a tremendous revolution too place in his soul: when Zarathustra’s soul entered into his soul. When at first Zarathustra`s soul entered into his soul he felt only the great richness of the former. At the end of his twenties he didn’t yet know that he was the reincarnated Zarathustra; but he did know that a great change had taken place in his soul during his twelfth year. And now he often had the feeling: Oh, how different everything was before that change during my twelfth year! He thought about how infinitely warm his heart felt then. As a boy he had been detached from the world, but had the liveliest feelings for the speech of nature, for what was wonderful in nature. But he had little disposition for worldly learning. He showed little interest in school work. It would be completely mistaken to assume that the boy Jesus was gifted in any usual way before his twelfth year. He was kind-hearted, had a deep understanding of what is human, great capacity for feeling: an angelic, gentle being. Now it seemed as if all that had been eradicated from his soul when he was twelve years of age. And now he thought and felt about how previously he had been united with all the deeper universal spirits, how his soul had been open to the depths of infinite space. And how since his twelfth year he had suddenly become adept at Hebrew erudition, which had sprung from within him. He thought about how on his travels he encountered the pagan cults and the wisdom and religiosity of Paganism streamed through his soul. He remembered that between his eighteenth and twenty-fourth years he had been in contact with the activities and achievements of common humanity. He then entered the Essene community at approximately twenty-four years of age, where he learned an occult teaching and knew the people who dedicated themselves to that occult teaching. He thought often of those things. But he also knew that he had only learned what humanity had accumulated in wisdom since antiquity - treasures of human wisdom, culture and moral achievements. He often thought back on how, before that twelfth year, he felt united with the divine primeval ground of being and everything seemed spontaneous, welling up from his warm, expansive, loving heart and closely uniting him with the other strengths of the human soul. These were the feelings which brought about a very special talk between him and the mother. His mother loved him terribly and often spoke with him about all the beautiful and great things which had become apparent in him since his twelfth year. At first he never spoke to her about the inner conflict which he experienced, so that she saw only the good and the beautiful. Therefore what he told her in this conversation, which was a kind of general confession, was all new to her, but she accepted it with a warm and gentle heart. She understood how he felt, that he was nostalgic for what he had before that twelfth year. So she tried to console him by speaking about the things which had become so beautiful and splendid about him since then. She reminded him of the renewal of the great teachings and wise sayings and treasures of the Jewish laws, which had come about through him. His heart was heavy when he heard his mother speak so enthusiastically about what he considered superseded. He said: That may well be, but whether all the wonderful old treasures of Judaism are renewed through me or some other, what does it mean for humanity? What has happened is essentially meaningless. Of course if the people had ears still capable of listening to the old prophets, then such a renewal of the prophets’ wisdom would be of use to them. But even if Elias were to come – Jesus of Nazareth said – and wanted to announce to our humanity the wonders he experienced in the expanses of heaven, the people are not there who have ears to hear Elias’s wisdom, or the older prophets, even Abraham and Moses. All that those prophets announced is impossible to announce today. The words would blow away in the wind. Everything I thought to have received is worthless today. He told how a great teacher had recently been more or less ignored. For although he had not the stature of the old prophets he was, nevertheless, a profound and important teacher – the good Hillel the Elder. Jesus well knew what Hillel meant for many within Judaism, even during Herod’s rule, when it was hard to gain respect. And he knew what profound words Hillel had spoken. It was said of him: The Torah had died among the Jews, but Hillel revived it. He renewed the original Jewish wisdom, for those who understood him. Hillel was a wandering teacher of wisdom; he wandered among the Jewish people like a kind of new Messiah. Meekness was his main characteristic. The people praised him highly. I can only mention a few examples of how Jesus spoke to his mother about Hillel in order to indicate how he felt about him. He described Hillel as having a mild, gentle character and who accomplished great things through gentleness and love. One meaningful story has been preserved which shows how Hillel was a patient man who was open to everyone. Two people bet on the possibility of angering Hillel, for it was well known that Hillel was never angry. One of them said: I will do all possible to anger him in order to win the bet. At a time when Hillel was most occupied (he was preparing for the Sabbath) the man who made the wager knocked at his door and said in a less than polite way – and Hillel was the head of the highest priestly authority, one accustomed to being addressed with respect – the man called out: Hillel, come out, come out right now! Hillel threw something on and patiently went out. The man said sharply: I have something to ask you. Hillel said, My dear man, what is your question? My question is, Why do the Babylonians have such narrow heads? Hillel answered most gently, Well, my dear, the Babylonians have such narrow heads because their midwives are so clumsy. The man left. But after a few minutes he returned and rudely called Hillel out again: Hillel, come out, I have a question for you! Hillel put his cloak on, went out and said: Well, my dear man, what is your question? I want to ask you why the Arabs have such small eyes. Hillel answered gently: Because the desert is so large, it makes the eyes small, the eyes become small observing the vast desert. The man who had made the bet was becoming anxious now. Hillel went back to his work. After a few minutes the man came again and called out rudely: Hillel, come out, I have a question to ask you. Hillel threw on his cloak, went out and gently said: What do you wish to ask me? I want to ask you why the Egyptians have such flat feet. Because the area where they live is so marshy, Hillel said and went back inside. A few minutes later the man came again and told Hillel that he had something else to ask – that he had made a bet that he could anger him, but he knew not how to do it. Hillel said gently: My dear man, it is better that you lose your bet than that Hillel be angered. That legend is told in order to show Hillel’s patience, even with those who antagonize him. Such a man is, Jesus of Nazareth said to his mother, in many respects like a prophet of old. And don’t we know many of Hillel’s sayings that sound reminiscent of the prophets of old? He repeated several of Hillel’s beautiful sayings, and then said: You see, dear mother, that Hillel is considered to be an old prophet who has come again. It occurs to me that what I know does not come from Judaism alone. Now Hillel was born in Babylon and was only occupied with Judaism later. But he descended from David, was related to the house of David from ancient times, as was Jesus. And Jesus said: If I could also speak as a son of David, as Hillel does, the people don’t exist who could hear me; such words are no longer relevant. In ancient times yes, but not now. To speak thus now is useless and of no worth. Evidence of the asundering I. All the greatness of the Mithras worship lived in his soul with those words, rising up as from an inner genius. He spoke with his mother about the greatness and glory of paganism and about what lived in the ancient mysteries of the various peoples, much of which converged in the Mystery cults of Asia Minor and Southern Europe. But he also carried in his soul the feeling that this cult had gradually changed and had come under demonic power, which he had himself experienced when he was around twenty-four years of age. It also seemed to him that the old Zarathustra teaching was no longer appropriate for the people. The second important thing he said was: If all the Mysteries were united and contained everything which was once great, the people are not there to hear it. It is all useless. And if I were to go around announcing the transformed Bath-Kol, if I were to declare the secret of why people can no longer live in their physical bodies together with the Mysteries, the people are not there today who would understand. Nowadays it would be demonic. People can no longer hear what was once announced and heard. Jesus of Nazareth knew that what he had heard as the transformed voice of Bath-Kol was an ancient holy teaching, an all-powerful prayer wherever the Mysteries were celebrated; it had been forgotten, but had come to him when he fell down on the pagan altar. He also saw, however – and he expressed it clearly in that discussion – that today it is impossible to make all that understood. Then he spoke of what he had learned in the Essene circles. He described the beauty, the greatness and the glory of the Essene teachings and remembered the Essenes’ gentleness. Then he spoke of the third important thing, which had come to him during his visionary talk with the Buddha: Not all people can be Essenes. Hillel was right when he said: Don’t separate yourself from society, but live and work within it. For what am I if I am alone? That’s what the Essenes do though; they separate themselves from the people, who are then necessarily unhappy. Then he told his mother about his experience after an intimate conversation with the Essenes: as he was at the gate leaving, he saw Lucifer and Ahriman running off. Since that moment, my dear mother, I knew that the Essenes protect themselves by means of their way of life and their occult teachings to the extent that Lucifer and Ahriman must flee from their gates. But they send Lucifer and Ahriman to others in order to be happy themselves. Those words greatly impressed the loving mother, and she felt herself transformed, and as one with him. And Jesus of Nazareth felt as though everything which burdened him had been lifted from him by this conversation. He saw it and his mother saw it. The more he spoke, the more she heard, the more she knew of all the wisdom that had lived in him since his twelfth year. He also transplanted all his experiences into her own heart. He was also transformed by that talk, so much so that his stepbrothers and other relatives thought he had lost his mind. What a pity, they said, he knew so much; he was always very quiet, and now he has lost his mind. They considered him lost. In fact he did walk around the house dream-like for days on end. The Zarathustra-I was preparing to abandon that Jesus of Nazareth body. And his last resolve was to leave the house almost mechanically and go to John the Baptist, whom he already knew. And then the event took place which I have often described: the baptism in the Jordan by John. During that talk with his mother, the I of Zarathustra withdrew. He was again what he was at twelve years of age, only grown up. And the Christ-Being descended into that body at the baptism in the Jordan. And at the same moment as this baptism in the Jordan took place, the mother experienced the end of her transformation. She felt – at the time she was forty-five, forty-six years old — she felt herself imbued with the soul of the woman who was Jesus’ mother until he was twelve when he received the Zarathustra-I; and who had later died. The other mother’s spirit had descended upon the mother with whom Jesus had the conversation. And she felt like that young mother who had given birth to the Luke-Jesus. Imagine what a hugely important event that was! Let us try to feel it, but also let us feel that now a special being lived on the earth: the Christ-Being in a human body, a Being who had not yet lived in a human body, who heretofore had only been in spiritual regions, who previously had not lived on earth, who knew the spiritual worlds, but not the earth! That Being only knew of the earth what was stored in the three bodies – physical body, etheric and astral bodies – of Jesus of Nazareth. It descended into those three bodies, as they had become under the influence of the thirty years of life which I have already described. Therefore the Christ-Being was unbiased in respect to his first earthly experiences. This Christ-Being was led at first into solitude. This is also indicated in the Akasha Record and the Fifth Gospel. Jesus of Nazareth, in whose body the Christ-Being now dwelled, gave up everything which had tied him to the world. The Christ-Being had come to the earth. At first he was drawn to what was impressed most strongly in the astral body, like a remaining memory. Yes, he thought, that is the body which experienced Ahriman and Lucifer fleeing and realized that the striving Essenes pushed Ahriman and Lucifer off onto other people. He felt himself drawn to Ahriman and Lucifer, for it is against them that humanity must fight. Therefore the Christ-Being, who had never existed in a human body, departed into solitude to do battle with Ahriman and Lucifer. I believe that the scene I am about to describe is essentially correct. But it is very difficult to observe such things in the Akasha Record. Therefore I would like to explicitly state that one or another detail may eventually be modified, but that the essential is there. The temptation scene appears in several Gospels, which describe it from different sides. I have often emphasized this. I have taken pains to investigate this temptation scene and would like to relate how it really was. At first the Christ-Being in Jesus of Nazareth’s body encountered Lucifer in solitude – how Lucifer works on people when they overestimate themselves, have too little humility and self-knowledge. Take advantage of man’s false pride and self-importance: that is what Lucifer wants to do! Lucifer approached the Christ Jesus and said more or less the words which also appear in the other Gospels: Look at me! The other kingdoms in which man dwells, founded by the old gods and spirits – they are old. I want to found a new kingdom; I will give you everything that is beautiful and glorious in the old kingdoms if you will enter into my new kingdom. But you must separate yourself from the old and recognize me! And Lucifer showed him all the beauty of the Luciferic world, all that would attract a human soul that had even a trace of pride. But the Christ-Being came from the spiritual world. He knew who Lucifer is and how the soul must act not to be tempted on earth by him. He knew nothing of Luciferic temptation; he knew though how to serve the gods and was strong enough to reject Lucifer. So Lucifer attacked a second time, but he came with Ahriman as support and they both spoke to Christ. One tried to goad his pride: Lucifer. The other spoke to his fear: Ahriman. The first said to him: Through my spirituality, through what I can give you, you will not need what you now need because you have entered into a human body as Christ. That body subjugates you, so you must obey the law of gravity. I can throw you down and the human body prevents you from overcoming the law of gravity. If you obey me I will annul the effects of the fall and nothing will happen to you. Ahriman said: I will protect you from fear, throw yourself down! They both closed in on him, but as they balanced the scales, so to speak, by their insistence, he was able to resist them. He found the strength which man needs to find on earth to raise himself above Lucifer and Ahriman. Then Ahriman said: Lucifer, you are of no use to me, you have not increased my power, only diminished it. So Ahriman sent Lucifer away and carried out the last attack as Ahriman alone and said the words which resonate in the Gospel of Matthew: Turn minerals into bread! Turn stones to bread if you claim to have divine powers. And the Christ-Being said: Men do not live by bread alone, but by the spiritual which comes from the spiritual world. The Christ-Being knew that well, for he had recently descended from the spiritual world. Ahriman replied: You may be right. But that you are right and insofar as you are right does not stop me from stopping you in a certain way. You only know what the spirit does which descends from the heights. You were not yet in the human world. Below, in the human world, there are completely different people; they truly need to turn stones to bread, they cannot nourish themselves by the spirit alone. That was the moment when Ahriman told Christ what one could know on the earth; which, however, the god who had just stepped upon the earth for the first time could not yet know. He did not know that it was necessary below to turn the mineral metal to money, to bread. So Ahriman said that the people below are forced to nourish themselves with money. That was where Ahriman still had power. And, said Ahriman, I will use this power! This is the correct description of the temptation story. The questions weren’t definitively answered – Luficer’s questions perhaps, but not Ahriman’s. Something more was required for that. As Christ Jesus left the solitude of the wilderness he felt himself released from all he had experienced and learned from his twelfth year on; he felt the Christ-spirit to be more connected with what had lived in him before his twelfth year. In fact he felt no longer connected with what was old and arid in humanity. He was even indifferent to the language spoken around him and he was silent at first. He walked around Nazareth and farther afield, visited many of the places he knew as Jesus of Nazareth, and there something extremely peculiar happened. Please note that I am telling the story from the Fifth Gospel, and it would make no sense to look for contradictions with the other four gospels. I am relating what the Fifth Gospel says. Silently, like having nothing to do with the surroundings, the Christ Jesus went at first from inn to inn, working with the common people. Ahriman’s saying about bread had left a deep impression on him. Everywhere he found the people who knew him from before, and these were the people to whom Ahriman had to gain access because they needed to turn stones into bread, or what is the same – turn money, metal, into bread. He had no need to associate with those who observed Hillel’s – or others’ – moral teachings. But he did associate with those whom the other gospels call tax collectors and sinners, for they were the ones most inclined to turn stones into bread. He spent much time with them. But here is the strange thing that happened. Many of them already knew him from the time before his thirtieth birthday, when he had been with them as Jesus of Nazareth. They knew his mild, kind and wise nature and he was well loved in every house and inn. That love remained. They often spoke of the dear Jesus of Nazareth who had come to those houses and those places. And the following happened - as though an effect of cosmic law. (I am relating scenes which often repeat themselves, which clairvoyant research can often confirm.) There were families for whom Jesus of Nazareth had worked, who sat together after work, when the sun had gone down, and liked to talk about the dear fellow who had been with them as Jesus of Nazareth. They spoke of his love and gentleness and about the warm feelings that streamed through their souls when he lived under their roofs. In some of these houses where they sat and talked about Jesus of Nazareth for hours on end, an image of Jesus of Nazareth would appear as a vision shared by the whole family. Yes, he visited them in the spirit; or also, they created his spiritual image. You can imagine what it meant for such a family when he appeared to them in a vision, and what it meant to them when he now returned after the baptism in the Jordan and they recognized him, except that his eyes were more brilliant. They saw the transfigured face which had once looked upon them so kindly, this man whom they had seen sitting with them in the spirit. We can well imagine how the people in such families felt and what the sinners and tax collectors experienced who, because of their karma, were surrounded by all the demons of those times. Now Jesus’ transformed nature became evident, especially in such people. Previously they had felt his love, warmth and gentleness, but now a magical power emanated from him. While previously they had felt merely comforted, now they felt themselves healed. They went to their neighbors who were also depressed and brought them to him. And thus it happened that the Christ Jesus, after he had defeated Lucifer and had only been stung by Ahriman, was able to accomplish what is described in the Bible as driving out demons. Many of the demons he had seen as he lay like dead upon the sacrificial altar went out of the people when he stood before them as the Christ Jesus. The demons saw their enemy. As he wandered through the land he often had to think about how he had lain upon the altar where instead of gods there were demons and where he couldn’t perform the rite. He also had to think about Bath-Kol, who had revealed the old mystery prayer to him, which I told you about. He concentrated especially on the center line of that prayer: “Now lived in daily bread”. The people who were around him now had to turn stones into bread. And many among them had to live from bread alone. And the words from that ancient pagan prayer – “now lived in daily bread” – sank deeply into his soul. He felt the whole incorporation of man in the physical world. He felt that because of this necessity for bread in human evolution the names of the Fathers in heaven, that is the names of the spirits of the higher hierarchies, had been forgotten. And he felt that no humans existed who could still hear the voices of the old prophets. He now knew that living in daily bread is what had separated men from heaven and what must lead them to egotism and into Ahriman’s clutches. As he wandered with such thoughts through the land, it turned out that those who most strongly felt how Jesus of Nazareth had been transformed became his disciples and followed him. From various stops on his way he would select one or another of them, those who felt that impulse most strongly. Soon there was a large number of such disciples. These people had a completely new basic outlook, who because of him were different from those whom he described to his mother as not being able to hear the old prophesies. And then the god’s mission on earth struck him: I am not here to tell men how the gods brought the spirit down to earth, but how mankind can find the way from the earth up to the spirit. Forgive us our debts as we forgive those indebted to us. The second line of the old mystery prayer – “witness of the I freeing itself” he changed to: but deliver us, and the first line, “Evil prevails” he made “from evil. Amen”. Thus the prayer which Christianity learned to know as the Our Father was transformed through the inversion of the voice of Bath-Kol, which Jesus heard when he fell upon the altar, to what the Christ Jesus taught as the new mystery prayer, the new Our Father. The Sermon on the Mount and other things Jesus taught his disciples came into being in a similar way. The Christ Jesus had a remarkable effect on his disciples. Please bear in mind that I am merely relating what is written in the Fifth Gospel. As he made his way through the land his effect on his surroundings was remarkable. It is true that he was together with his disciples but, because he was the Christ-Being, it was as though he was not only present in his own body. One or another of the disciples would sometimes feel as though he were also acting in them, in their own souls. They felt that the Christ-Being was in them and began to say things which in reality only the Christ Jesus himself could say. So the group traveled around and spoke to other people but it wasn’t always Christ Jesus who spoke, but one of the disciples, for he shared everything with the disciples, also his wisdom. I must admit that I was astonished when I realized that the conversation with the Sadducee, as related in the Gospel of Mark, was not spoken by Christ Jesus from Jesus’ body, but by one of the disciples. It often happened that when Christ Jesus left the group he was still with it. Either he walked with them spiritually or he appeared to them in his etheric body. His etheric body was among them, walked around the country with them, and it was not always possible to determine whether his physical body was actually there, or if it was his etheric body. That was the manner of the interaction with the disciples and the people when Jesus of Nazareth became the Christ-Jesus. He, though, experienced this time as I have already mentioned. At first the Christ-Being was relatively independent of Jesus of Nazareth’s body, but had to gradually become more and more familiar with it. And the longer he lived the more he was bound to Jesus of Nazareth’s body, and a profound pain came over him in the last year due to being bound to the ailing body of Jesus of Nazareth. But he continued to wander about the land with a large group of disciples. One spoke here, another there, and one could think that it was always the Christ Jesus – for Christ spoke through them all. It was once possible to listen in to a conversation among scribes. They said: In order to frighten the people it would be possible to kill any one of them; but it could be the wrong one, because they all talk alike. That wouldn’t help us, because then the real Christ Jesus could still be there. Only the disciples can identify him. They would certainly not tell their enemies which is the right one. But Ahriman had become strong enough in respect to the question which remained, which Christ couldn’t resolve in the spiritual world, but only on earth. He would have to experience the most terrible deed: what it means to turn stones into bread. For this Ahriman made use of Judas of Iscariot. There was no spiritual means available to identify who among men who revered him was actually the Christ. For where the spirit worked he was not identifiable. 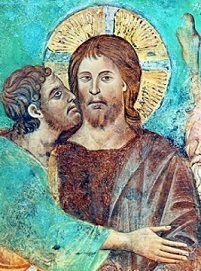 Only when an individual – Judas – used means which were unknown to Christ, could he be recognized. He could not be recognized except when someone in the service of Ahriman would betray him for money alone. In this way the Christ Jesus was bound to Judas, something which befell him during the temptation event, which is understandable in a god: He didn’t know that it was only correct in heaven that one does not need stones for bread. The betrayal took place because Ahriman had retained his sting. Therefore Christ had to come under the power of the Lord of Death, insofar as Ahriman is the lord of death. That is the connection between the story of the temptation and the mystery of Golgotha with Judas’ betrayal. There is much more to be said from the Fifth Gospel than what I have said here. But during the course of human evolution surely the other parts of the Fifth Gospel will be revealed. I have attempted to give you an indication by telling you more in the way of how it is. At the end of these lectures, it has occurred to me once more what I said at the end of the first lecture – that the needs of the times make it necessary to speak about this Fifth Gospel now. And I would like to urge my dear friends to treat what has been said about the Fifth Gospel in the appropriate way. You see, we already have enough enemies and they act in a quite peculiar way. I don’t wish to speak of this now, perhaps you already know about it from reading the “News-sheet”. You also know the strange fact that there are people who have been saying for a long time now that what I teach is infected with all kinds of dogmatic Christianity, even with Jesuitism. Especially certain followers of the so-called Adyar-Theosophy talk in the worst way about this supposed Jesuitism, as well as many more hateful, unscrupulous things. And a certain source claiming outrage at the narrow-mindedness and perversity of our teaching, then completely falsified it. A man from America learned our teaching over a period of many months, wrote it down, brought it to America in a watered down version and then published a Rosicrucian Theosophy, which he copied from us. [The reference is to Max Heindel – ed.] He says that he learned a lot from us, but that he was then called by the masters and learned more from them. He was silent about the fact that he took the more profound things from my unpublished lecture cycles. One could accept that such a thing could happen in America One could, like Hillel, remain meekly silent – even when it spreads to Europe. Those who are most enraged at us here make a translation and in the translation say: Although there is also a Rosicrucian world view in Europe, it is narrow-minded and Jesuit-like, and it can only thrive in the pure air of California. Well, that’s enough! That is our enemies’ method. We can look at these things not only calmly, but also with compassion – but we may not close our eyes to them. When such things happen care must be taken by those who for years indulged such people who acted without scruples. I would really prefer not to speak about such things were it not necessary in the service of truth. One must see everything with clarity. When on the one hand these things are spread around, it does not protect us from others who may find such things unpleasant in a somewhat more honest way. I won’t annoy you with all the silly junk written by both sides. All this peculiar literature by Freimark, Schalk, Maack, etc. would not be worthy of note because of its inferiority. But there are people who simply cannot stomach something like the Fifth Gospel. And perhaps no hate was as honest as that which arose when something about the mystery of the two Jesus children was first made public. Real anthroposophists will treat this Fifth Gospel, which is given in good faith, correctly. Take it with you, discuss it in the branches, but tell the people how it must be treated. Make sure that it is not cast irreverently to people who might ridicule it. We stand against our times with clairvoyant investigation, so necessary for the times, and above all against academe. We are aware of this. Those who were together with us at the laying of the foundation stone of our building know how necessary is the spreading of a spiritual teaching with strict observance of truth. We tried to be conscious of how distant our present culture is from this search for truth. One can well say that the cry for the spirit is heard through our times, but that people are too proud or limited to want to know anything about the true spirit. The amount of truthfulness necessary in order to witness the spirit must first be acquired. For this amount of truthfulness is lacking in today’s educated milieu and, what is worse, this lack is not recognized. Treat what you have heard here about the Fifth Gospel so that it is treated reverently in the branches. We do not emphasize this due to egotism, but for a completely different reason, because the spirit of truth must live in us and the spirit must stand truthfully before us. People talk today about the spirit, but have no idea of the spirit. There is a man who has won great respect because he talks so much about the spirit – Rudolf Eucken. He talks a lot about the spirit, but when you read his books – try it sometime – he always writes: The spirit exists, one must experience it, be together with it, sense it, and so on. All through these books endlessly repeated: spirit, spirit, spirit! They talk about the spirit in this way because they are too lazy or arrogant to go to the source of the spirit. And such people are greatly respected nowadays. It is difficult today to be convincing about what is brought in such a concrete way from the spiritual world, such as the description of the Fifth Gospel. Seriousness and truthfulness are requisites for that. In one of Eucken’s latest books, “Can We Still be Christians?”, he goes on and on about soul and spirit, spirit and soul, like a tapeworm, and many such volumes are written, for that is how one gains great respect and fame – when one claims to know something about the spirit, for people don’t notice when reading the amount of untruthfulness involved. On one page we read: Humanity is beyond believing in demons; no one can be expected to believe in them. But in another place in the same book we find the peculiar sentence: “Contact of the divine with the human creates demonic powers.” The same man speaks seriously here of demons. Isn’t that the deepest inner untruthfulness? But I don’t see that many of our contemporaries notice this untruthfulness. We stand at a point today when the truth about the spirit is in opposition to our times. We must always remember this in order to be clear about what we must do in our hearts if we wish to participate in announcing the spirit, the new life of the spirit which is so necessary for humanity. How can one hope to be well received in leading the human soul to the Christ-Being through spiritual teaching when the clever philosophers and theologians say that there was a Christianity before Christ! They show that the rituals and similar legends existed previously in the Orient. The clever theologians explain to all and sundry that Christianity is nothing more than a continuation of what previously existed. And such literature is greatly esteemed by our contemporaries, who don’t realize what is happening. When one speaks of the Christ-Being as spiritually descended, and then finds the Christ-being worshiped in the same ritual form as the pagan gods were worshiped, and when that is used to deny the Christ-Being, which is the case, it is using the following logic: Someone stays at an inn and leaves his clothes there. It is obvious from the clothes that they belong to him. Afterward a person such as Schiller or Goethe due to some circumstance puts the clothes on and comes out with the clothes belonging to the other person. Then someone goes around asking what kind of special person is that. I have examined the clothes, they belong to so-an-do, and he is not at all special. Because the Christ-Being to some extent uses the clothes of the old rituals, the clever people come and fail to realize that the Christ-Being only puts them on as a garment and what is now in the old rituals is the Christ-Being. And take the sum of scientific monistic considerations, libraries full – they are evidence of the Christ-Being’s clothes, and they are even true! The hounds of cultural evolution are held in high regard and their science is accepted. We must paint this picture in our minds if we want to absorb what is meant with this Fifth Gospel, not only in understanding but also in feeling. What is meant is that we must assert our truth correctly in these new times as a new annunciation, and realize how impossible it is to make it comprehensible to the old times. Therefore Gospel words may be spoken now as we take leave of each other: We will not get far in spiritual development with the way people think today. Therefore this thinking must be changed and put in a different direction. And those whose nature is one of compromise, who have no desire for a clear picture of what is there now and what must come, will be of little use in what is spiritually necessary in the service of humanity. I was obliged to speak of this Fifth Gospel, which is sacred to me. And I take leave of your hearts and souls with the wish that the bond which has arisen between us through other things may be strengthened through this spiritual investigation of the Fifth Gospel, which is especially dear to me. And perhaps this can release a warm feeling in your hearts and souls: When we are separated in distance and time we want nevertheless to be together, feel together what we are to develop in our souls and to what we are duty bound by the spirit in our times. Hopefully what we strive for will be accomplished in every soul. I think this is the best farewell greeting I can give at the end of this lecture cycle.